If you ever wondered how experimental theater works—which you probably haven’t—but just in case you have, you can go see Madeline’s Madeline, and it will give you a good demonstration of what it could be in the wrong hands. Most of the production is ad lib, and in this case the director (of the troupe and the movie) played by Josephine Decker, devises general outlines of scenes and gives them to the actors to act out, but we never really see a regular story with a beginning, middle, and end. That’s not to say there isn’t any plot at all; it is primarily a description of a mother-daughter relationship. In what story is there, Director Evangeline seems completely enthralled by one of the young actresses, Madeline (Howard), singles her out from among the cast members, and gleans information from her about her real life. She then incorporates these tidbits into scene after scene in her film as she hears about them. Evangeline makes no secret about the fact that she is revealing intimate details about Madeline’s life; in fact, when Madeline’s mother, Regina (July), drops her off for rehearsal one day and comes into the room, Evangeline has her take part in the improvisations. Evangeline’s devices turn out to be rather cruel, because Madeline, a teenager, and her mother have significant conflicts. Madeline is a strange girl, adeptly personified by Helena Howard. This is Howard’s first film, and she has become quite a sensation already. She is captivating onscreen, and easily mimics any kind of character that comes into her head or one she is instructed to portray. She is a natural for improv, and the only saving grace of this film. Regina, her rather incompetent, overly protective mother, can be sugary sweet one minute but then humiliate her daughter the next. For instance, she reveals to Madeline’s friends that Madeline had been in a psychiatric hospital at one time. She is clearly afraid of her daughter, and this often spills out into the open. But this is not really the cruel part of the film; Regina does love Madeline, she just doesn’t seem to know how to handle her. There is no mention of a father. 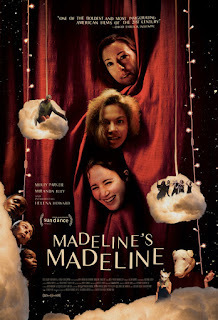 To me, the cruel part of the story is Evangeline exploring these conflicts with Madeline, observing them when she sees daughter and mother together, blithely inserts a wedge between them when she can, and to top it off, has the troupe act out the conflicts with full knowledge that it is about Madeline and her mother. The expression on Madeline’s face during some of the scenes is heartbreaking. Eventually, the disbelief and horror among the cast is likewise evident. But Madeline is no weakling like her mom and is decidedly a match for Evangeline. She knows how to play the same games, one of which she tries out on Evangeline’s husband at a party, and, ultimately, one-ups Evangeline in a way that evens the score. At a time when women are trying to be nicer to other women, this film set us back, with its emphasis on things we have seen too many times in Mean Girls and similar films. Evangeline is as much an adolescent as the actors in the troupe she is directing. Just because this is being called an “art house” movie, shouldn’t mean that common decency and ethics should be thrown out, or that we should continue to pit females against one another. Moreover, with all the emphasis on privacy in contemporary culture, this film bulldozes right over it, disrespecting the actors and women and mothers in general. This is a film that perpetuates outdated myths about women working with women.